Sometimes, its just not possible for friends or family to be available for your big day. Fortunately, a livestream can be set up with relative ease, so nobody need miss out! Our main service is to provide a means by which people can view your wedding through their internet browser. We can provide a simple webpage with an embedded player (or just the player code, should you prefer to embed it on your own webpage) through which people can view the livestream, as well as support for the day to make sure everything runs smoothly. If you have a camera and an encoder, we can provide you with the details to put into it, and then its a simple case of pressing 'Start'! If you're feeling a little confused or lost, don't worry! We reccomend using Adobe Flash Media Live Encoder, as it is a simple and free tool to use. This, plus a camera with a USB output (or even a decent webcam) means you can set up an encoder on a laptop without spending large amounts of money on professional level equipment, and still have decent quality for your viewers. 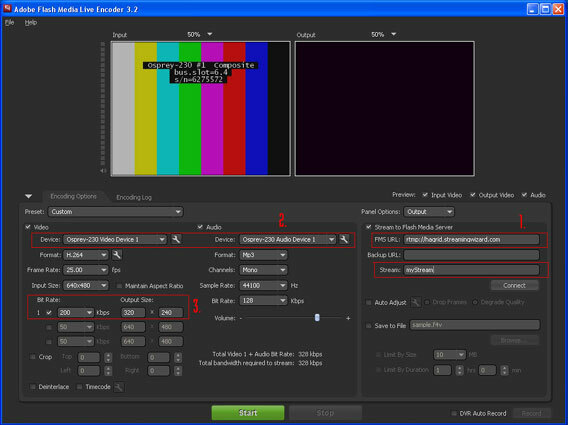 Here is a screenshot showing the Flash Media Encoder interface. 1. These are the details you will need to connect to our servers, which we will provide you with. 2. This is where you choose your input device, such as your webcam. 3. Here you choose what bitrate you want to encode at. We reccomend anywhere from 500-800 kbps, as you shouldn't need to go over 1 Mbps. As an alternative, if you have an iPad or iPhone, you can download the Wowza GoCoder app (for $4.99)and stream directly from your iOS device! The limitations of this would be your internet connection, shaky hands, and the device's battery life, as encoding can quickly eat through your battery power. Here's some step by step instructions showing how to use the GoCoder app with our services. When you first launch the app, it will have an overlay labelling each button. 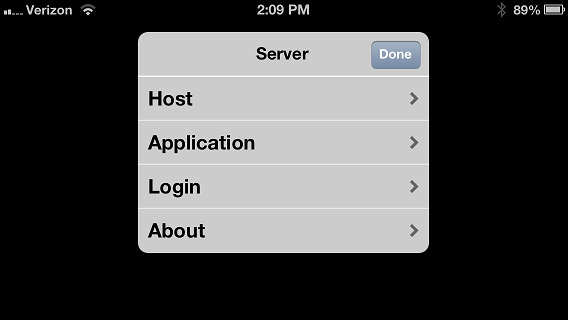 You will want to first input the server details by tapping the 'Server' button in the top right. 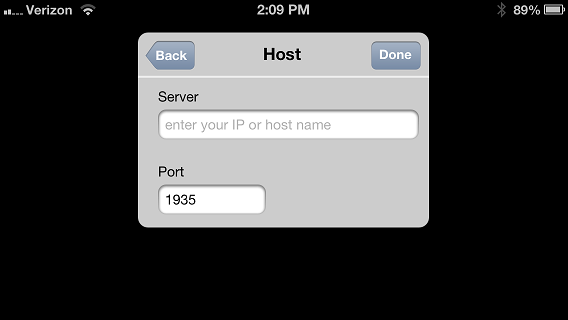 You will then want to tap 'Host' to type in the server name and port (which we will provide). 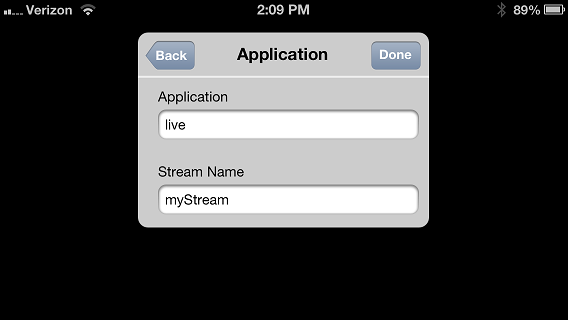 Tap 'Done' and then tap 'Application', and type in the Application and Stream Name (that we also provide). Tap 'Done' again, and then tap 'Login' and type in your user details (which we provide). After that, you can change any of the other options to what you like (although the defaults are the reccomended). You can change the bitrate by tapping the button in the bottom left corner. The higher the bitrate, the better the video quality, but you will also need a stronger internet connection or it will severely affect the video quality. Get in touch with one of our team today on 01926 313448 to discuss your requirements or to request a rate card.